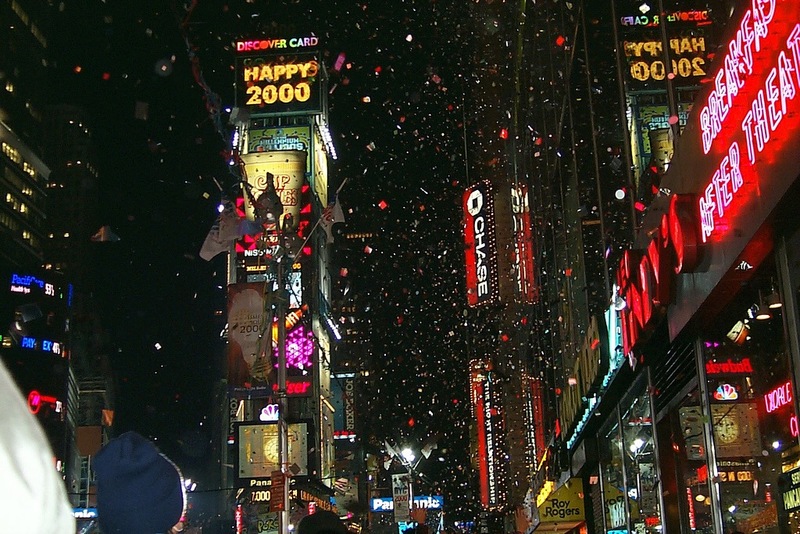 Finally it’s New Year’s Eve 1999, the most talked about event for the last few years, the hype, the Y2K concerns, the end of world predictions and I’m here in New York City home of many famous celebrations for the new year!! We got up early to get down to Times Square to celebrate Australia’s New Year which is one of the first places in the world (New Zealand beat us) and occurs at 8 am NY time. Quite a few people were already in Times Square including heaps of Aussies. Watching on the big screen it looked like a lot of fun in Sydney with no apparent problems. We played up in front of the TV cameras. (Update: a few days later it was confirmed we made the TV news back in Australia!!). We went back to the YHA Hostel to rest up and have an early lunch. At noon we returned and got possibly the last great spot in the central area watching the temporary stage and the New Year’s Ball. Times Square was filling very fast, this wasn’t going to be a typical 500k crowd but millions for this year’s event. Our spot was around 46th Street and Broadway. Every hour, and sometimes half hour, we counted down another country’s New Year’s Eve with dancers on the stage representing that country or region until after 12 hours of standing in the colour time came around. For the USA / New York countdown the Mayor appeared and the countdown began at T minus 60 seconds. The countdown got louder and louder, it was impossible to think and then the explosion of sounds, light, fireworks and streamers welcomed in the new century. Both Jon and me had leg problems at this point. Standing in freezing tempatures for 12 plus hours with little movement is not great for the blood circulation. We didn’t stay for the West Coast countdown instead we literary liked back to the hostel and I believe I got a preview of how I’ll be walking as a very old man, still want and AWESOME moment!!! This entry was posted in Travel, World Trip 1999-2000 and tagged New York City, USA. Bookmark the permalink.